You made a good choice in looking at base running drills because the one skill that receives less attention than any other is running the bases. If a player is fast everyone assumes he can run the bases fast. And if he is slow, they assume he will clog up the base paths. Neither statement is true. Running the bases involves much more than just being fast. Yes, being fast helps. But the best runners are not the fastest players. The two base running drills described below are just the beginning drills for running the bases. The first one, “Running Thru First”, should be taught at the t ball level, but we still see nine and ten year olds not doing it. Hopefully your team is not having this problem. But if so, take a look at it. 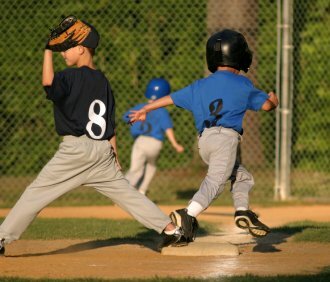 The second one, “Base Running Relay”, can help improve the base running skills of any age player. You might use this drill for an end of practice conditioning drill, rather than just running wind sprints. This drill is mainly for the younger players. Many times on a poorly coached team you will see runners stop at first base, rather than run all the way thru the base. Most do not know better and need to be shown that they can run at full speed on past first base. They need to be taught that after crossing first base, they should turn to the right. If they turn to the left back onto the field, they can be tagged out. So be sure and show them the proper way of returning to first base. A good drill to use is having the boys line up at home plate. One by one they will run to first on your command. Be sure they run thru the bag, and make a turn to their right. After all have gone, try the drill again. Only this time have some of the runners go to second. Have them slide into second. This makes the drill also a sliding drill. Your command for them to turn and go to second should be “Go Two”. Your command for them to run thru the base should be “Thru the Bag”. These two terms are used by many teams. To make this drill fun and competitive, time them running to first base and announce their time. The boys will hustle a lot harder if you yell out their times. Also, time those that you send to second. 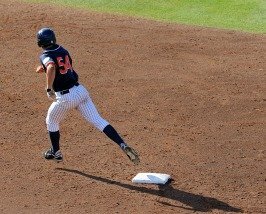 Have you noticed your players not running the bases aggressively? This drill will sharpen their base running skills. As baseball drills go, this one really accomplishes two things. First, we add peer pressure to the base running drill, and second, if you do this drill with two or three repetitions, the boys will be getting a good workout. Split your team in half. If you have an odd number of players, then the short handed team will have to have one member run twice. Start half the team at home plate, and the other half at second base. Give the first runner in each line a baseball. Before starting this base running drill, demonstrate to the players that the fastest way around the bases is stepping on the inside corner of the base when advancing to the next base. If players are not shown this, many will step in the middle of the base. A good base runner can use the inside corner of a base to push off and get more speed. This could easily be the difference between getting thrown out at home or being safe. Now start the drill. On your command the two runners with the baseball circle the bases. Have other coaches watch to make sure no one misses a base. This is a relay race. Once the runner that started from home gets back to home, he hands the baseball off to the next runner, who takes off around the bases. The same exchange takes place at second base. If you have five or more on a team, I would suggest you have them go thru the line twice before stopping. And, of course, the first team that finishes wins. Winners get the prize, and losers are left to gripe. Good luck with these base running drills. If you want to see more helpful baseball drills, be sure to visit the other baseball drills on this website.